Cool pillow. I love the fabric choices you made. The dogwood doesn’t look half bad. At least the pattern is consistent and your work will look smoother over time. Wouldn’t it be great if we could quilt using a spirograph? I finally learned how to set up my machine for FMQ. I just now need to work up the courage to practice! Thanks for sharing your process. Practice make perfect and apparently some good music adds to the process 🙂 Good job! I love the pillow top! Your pillows are beautiful! FMQ takes practice, and a good machine helps a lot. Good for you for working at it. I love the colors of your bottle pillow. It seems like everyone is trying the dogwood quilting pattern these days. I haven’t had a project to do it on, but I am eager to try it out as well. 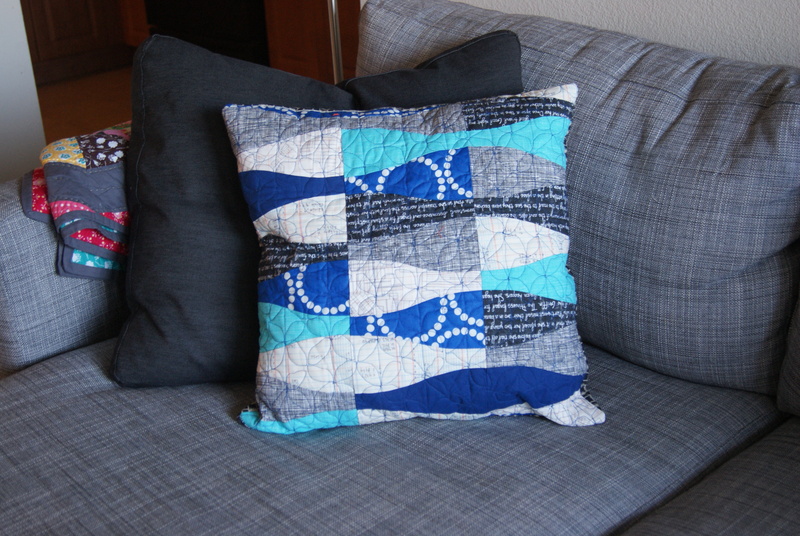 I have only quilted using FMQ and I love it. On my very first entrance into one of my local quilt shops I started chatting with the person working and she couldn’t stop telling me that FMQ changes your life! SO, I never tried with straight stitch and went right into FMQ. I’m glad I did – there is so much freedom! Great Finish! 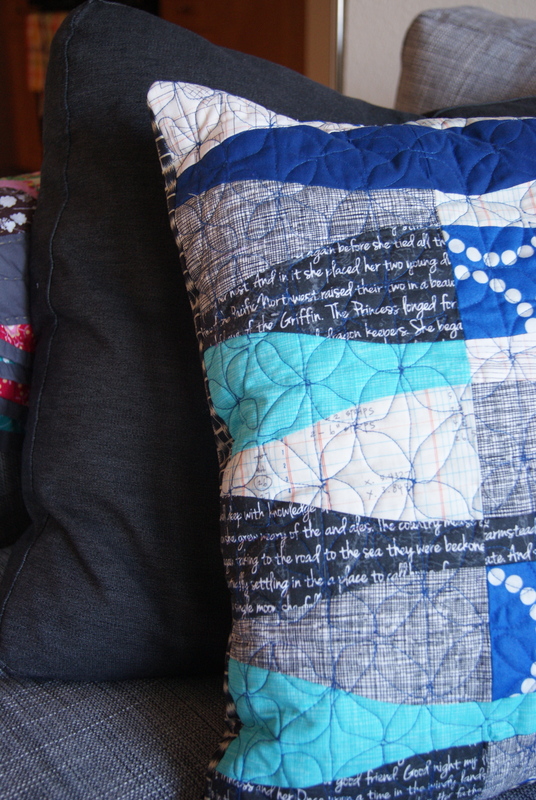 Love the quilting and the fabric selection. This is really beautiful! I love this cushion, great design and colors. 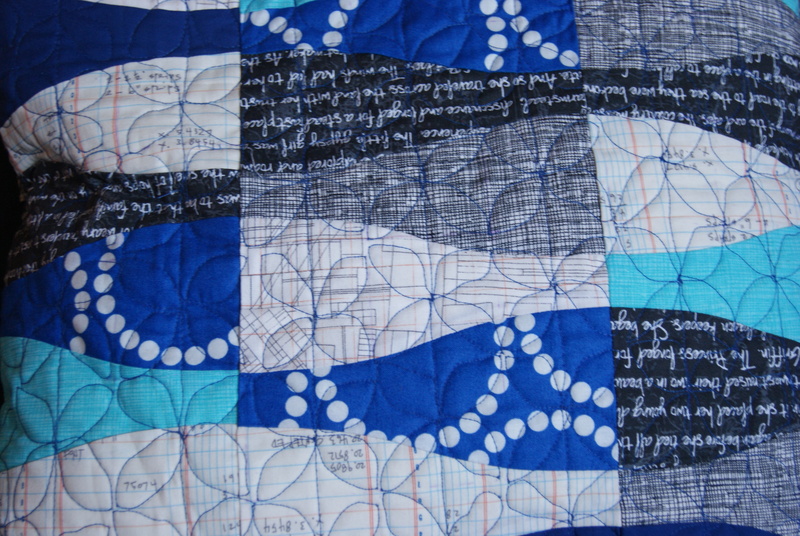 I like how the quilting turned out….its almost a modern impression where nothing is suppose to be perfect. Thanks for this. Not only is your curved piecing inspirational, but I’m struggling with FMQ, and you are giving me confidence to keep trying. You can do it, Laura! Keep practicing and each day you will get better. I am a witness that this is true. Your curved piecing looks fantastic. I love the colors you chose. I am glad you practiced! It’s the only way and I have found that you get leaps and bounds better very quickly! I have done this quilting pattern with the grid but I used the walking foot …you just pivot at each intersection…it makes a point and perhaps more an orange peel pattern but much easier than trying to free motion in that small a space….